Mutton Biryani has its own unique taste and it is much better than chicken biryani. The best way to celebrate your Eid ul azha is with the enrich flavors of this dish. Try this traditional recipe and enjoy your meaty eid. I love to eat this biryani with green chunky salad and raita. Heat two-liter water in a pan and put mutton into the water, boil for a while and prepare the mutton stock. Put onion, ginger, garlic, coriander, fennel, cinnamon, star anise, black pepper, and clove into netting cloth and make a bag. Now keep this bag into meat pan. Add clarified butter in a separate pan and fry onions until light brown. When onions become light brown then take out a little quantity of onion from it and keep aside. Now add meat, ginger garlic paste, salt, red chili and green chili in same pan and roast well. Then add yogurt and potatoes and roast. Now add cumin, rice, mutton stock and lemon juice, cover and cook for a while. When water dries up then remove the lid and mix yellow food color. Steam on high flame. Then do low flame after few minutes and keep on steam for 10 to 15 minutes. Finally, add fried onion and tomato for garnishing. 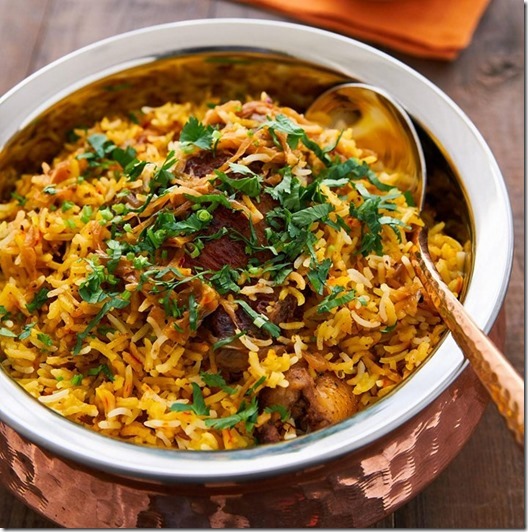 Delicious mutton biryani is ready to serve.